The purpose of this study is to examine the Chinese confrontation, on the Pacific Coast, as it was experienced and rationalized by the white majority. 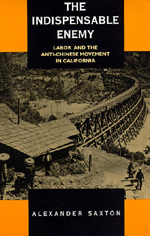 For reasons which will be evident in what follows, the main body of the work (chapters 3 through 11) will focus on the Democratic party and the labor movement of California through the forty-year period after the Civil War. The two opening chapters turn back to explore aspects of the Jacksonian background which appear crucial to an understanding of what occurred in California. The final chapter looks beyond the turn of the century to trace certain results of the sequence of events in the West for the labor movement as a whole, and to suggest the influence of those events upon the crystallization of an American concept of national identity. Alexander Saxton is Professor Emeritus of History, University of California, Los Angeles.